It’s important to start with good quality broth. You can make your own or even purchase good quality broth at your local farmers market or specialty grocery store or have your grandmother make it for you. Then in a large pot put the 8 cups of broth, garlic, ginger, soy sauce, chili paste, honey, kombu, scallions, mirin, bonito flakes and salt and bring to a low simmer for 10-15 minutes covered, then turn off and let sit covered while preparing ramen, eggs, mushrooms and scallions. Boil water for the ramen and eggs in separate pots. Prepare additional toppings of your choice. Add 1 tablespoon baking soda and salt to ramen water and boil according to package directions. (the baking soda will cause the water to fizz so make sure you have a large pot for the ramen) The baking soda will make the water more alkaline and turn regular pasta into more of a ramen like noodle. Boil pasta according to directions on package for aldente and then make your 6 minute eggs. With a small fine mesh strainer remove ingredients from broth, then add miso and sesame oil and whisk in until miso is dissolved, keep hot with lid. After 6 minutes shock the eggs in ice water and peel immediately, set aside in bowl. 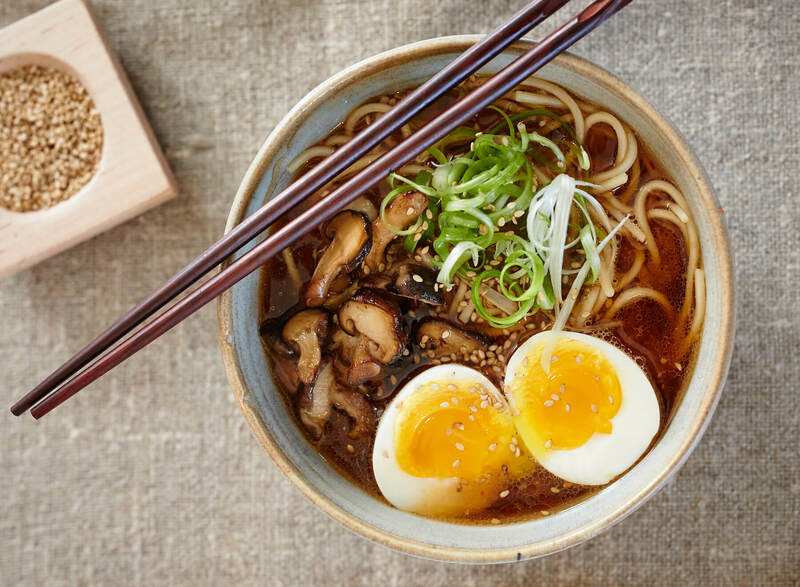 To Serve - In a large ramen style bowl put ramen, a ladle or two of hot broth, slice egg in half and set on ramen, then garnish with scallion, mushrooms and sesame seeds. Eat immediately and make sure you slurp the noodles.